Did you know that the way the credit reporting system works in Australia has changed significantly in March 2014? Since then, a new concept has been introduced to Australia, which has been at the core of the credit reporting system in many other countries (like the UK or the US) for many many years now. Another major change that has occurred at the same time is what’s called comprehensive credit reporting. If you want to delve a bit deeper into the information and also make sure you are getting it from trustworthy & unbiased sources, I recommend you check the websites of the Australian Information Commissioner & the ASIC MoneySmart program. You may think that all of this really does not concern you in any way as you don’t have any loans outstanding, don’t have a credit card and always pay for everything using cash or a debit card. However, that would not be true! Credit scores and the credit reporting system as a whole affect almost every single adult in Australia. Do you have a postpaid phone plan account? Do you have an internet connection or landline at home? Do you use electricity or natural gas? No doubt you’ll answer ‘yes’ to one or more of the questions above! If you did, you have a credit file and a credit score. The additional information which is now included in your credit file, and which is used to determine your credit score, has been collected since December 2012 but has only started being used in March 2014. Whether or not you made the payments by the due date. It is important to note that no payment or even partial payment by the due date are both considered as missed payments. 60 days or more have passed since the due date for payment and the creditor has asked you to pay the debt either in person (for example by phone call) or in writing (by sending a written notice to your last known address). Your credit file now also includes information on any commercial or business loans you have applied for, regardless of whether you were approved or not for these loans. Bottom line, it is crucial that you always pay your bills on time including your utility and telco bills. If you are the forgetful type, I suggest you set up direct debits for all these accounts to avoid any issues. The good news is that if you are diligent with your bills, your good behaviour is ‘rewarded’ as your good repayment history is now also included in your credit file and has a positive impact on your credit score. Every Australian can obtain a copy of their credit report for free once a year. If you have been denied credit (remember that a utility account is considered a credit product) within the last 3 months, you can obtain another copy for free even if it hasn’t been a year since you last requested one. Australia currently has three credit reporting agencies. They are all commercial for-profit operators who have been licensed by the government to maintain credit files on all of us. Each company maintains its own independent records so you will have to get a credit report from each of these three companies. They all have a turn around time of around 10 business days for the free service or you can opt for the paid service and get your credit report either immediately or within a day. If you now live, or have ever lived in Tasmania, you might also have a credit file with the Tasmanian Collection Service and will need to obtain a credit file from them as well. What is a credit score and how does it impact me? One of the most significant changes introduced under the new mandatory “comprehensive credit reporting” regime, which kicked in on July 1, 2018, is a personalised credit score for every adult in Australia. This concept of credit scores existed overseas for quite some time now and in places like the US for example, it is so important and so pervasive that people ‘live and die’ by their credit score (including things like getting a job or being approved for a rental property). This may sound a bit extreme but it really is the truth and Australia’s First Lady of Personal Finance thinks that it won’t be long before this is the reality facing us all here in Australia as well. A credit score, in very simple terms, provides an assessment of how much of a potential risk you pose to credit providers by defaulting on your obligations if they were to enter into a credit contract with you. How does a credit score rule your life? The lower your credit score, the higher of a credit risk you are and as a result, the higher the chances lenders and other credit providers (such as telecommunication and utility companies) will not want to have anything to do with you or apply ‘sanctions’ before agreeing to take you on as a customer (e.g. require a security bond, require a higher upfront deposit or apply a higher interest rate) to compensate themselves for the higher risk they are taking upon themselves. It is important to note that each credit reporting agency has its own scale and methodology for calculating a credit score. This means that the actual numerical value of your credit score will be different with each of them. Saying that however, the ‘gist’ of what that number means is the same as, in all cases, the aim of that number is to place you on a ‘creditworthiness scale’ for the benefit of finance providers (which includes utility companies and also Telcos who use it if you sign-up for any postpaid plan with them). I really don’t want to confuse you any further by going into complicated finance jargon so instead suggest you watch the video below from a mortgage broker which explains quite well how the credit score is used in ‘real life’. If you want a detailed explanation of how the score is calculated and what factors are taken into account, I suggest you read this article from financial comparison site Finder which explains how Equifax, the biggest credit reporting company in Australia, is calculating their credit scores. The process is quite similar for the other credit reporting companies as well. Comparison site finder.com.au have conducted a survey amongst more than 2000 Aussies to see what they know about the new credit score regime and how they are working with it. The majority of Australians (67%) don’t expect a lender to reject a loan or credit card application based on their credit score. However, 25% of Aussies fear they will get rejected for a loan or credit card because of their poor credit score. Aussies have awesome credit: or at least they think they do! 71% of Aussies have no concerns about their credit score – rating it as either very good (21%) or excellent (50%). When asked how they would rate their credit score, 14% said ‘good’. Slightly more women (10%) than men (7%) have no clue what their credit score is. The majority of Aussies (82%) have never attempted to improve their credit score, and 20% of Australians don’t even know how. 25% took out a new credit card to establish a credit history. Surprisingly, the demographic that was most likely to have done something about their credit score were Millennials, with 34% having made the move to improve their number. This is higher than Gen X at 17% and Baby Boomers, with only 10% having ever attempted to improve their credit scores. First of all, you need to remember that each credit reporting agency has their own system for calculating credit scores and therefore, you will get a different number from each of them. Get it through a dedicated online service. The good news is that in both cases, it shouldn’t cost you a cent! If you want to get your credit score quickly & easily and either don’t want to wait for your full credit report to arrive in the mail or you’ve already used up your allowance of free credit reports for the year (one per person, per credit reporting company unless you have been denied credit within the last 3 months), you can use an online service for quickly retrieving your credit score directly from the credit reporting company. Just to alleviate any concerns you may have: these services are almost always completely free (they make their money by other means as I’ll explain shortly) and using them won’t have any negative impact your credit score. The credit scores from Equifax (formerly known as Veda) are the most widely used in Australia due to the fact that they have been down under the longest and therefore have the most comprehensive data on all of us (or so they claim). This doesn’t mean however that their information is the most reliable or most up-to-date. They often make mistakes and then refuse to correct them, even when provided with the appropriate documentary proof. To the best of my knowledge, the only service which currently allows you to get your Equifax score for free is Get Credit Score. Get Credit Score is a fully-owned subsidiary of Equifax themselves. Once they verify your identity, they will show you your Score with Equifax. 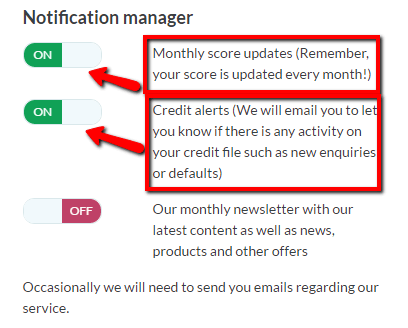 The score will be updated every month in your account dashboard provided you log in at least once during the month. Just like Equifax, Illion have been operating in Australia for quite some time now but you may know them under their previous name Dun & Bradstreet. Their credit scores are widely used by Australian lenders but not as widely used as those from Equifax. The best free service to obtain your Illion credit score (and keep ongoing tabs on it) is Credit Simple which are a fully-owned subsidiary of Illion themselves (just like Get Credit Score are owned by Equifax). In order to get your score, you will need to supply them with personal information such as full name, date of birth, current and previous addresses plus details of an ID document (Drivers License or Passport). They will use this information to verify your identity and give you your Dun & Bradstreet credit score. Unlike the other credit score retrieval services, Credit Simple can be a ‘one stop shop’ when it comes to the information Dun & Bradstreet have about you. This is because they also give you access to your full credit report with Illion through their dashboard. Not just your credit score. Better yet, this access is ongoing and pretty much ‘real time’ so if Illion record any new information in the credit file they hold on you, you’ll be able to see it straight away (and free of charge). Basically, if you use Credit Simple, you no longer need to request your Illion credit file separately. Credit Simple also have this strange (or some would say ‘quirky’) thing where they compare your credit score anonymously against other people in your age group, your street and even your star sign. Finally, if you check your score through Credit Simple and get a very low score (or even zero god forbid), they do a decent job at explaining why. While Experian is a relative ‘newcomer’ to Australia, they are massive overseas and especially in the US where they are one of the biggest credit reporting companies (if not the biggest!). Due to their relative short tenure down under, their credit scores are not as widely used at present. However, it is still well worth your while keeping tabs on your personal credit score with them as well. This is especially given the fact that unlike the Equifax Scores which you can only access every six months, Experian allows you to access your personal credit score once a month. The best free service to keep tabs on your credit score with Experian is Credit Savvy which are owned by mortgage brokers Aussie Home Loans, themselves a subsidiary of the Commonwealth bank. You’ll need to give Credit Savvy a valid email address as well as the details of your Australian drivers license, Passport (Australian or overseas) or Medicare card in order for them to verify your identity electronically and give you your credit score. One thing I really like about Credit Savvy is the fact that they allow you to monitor changes to your credit score, and to your credit report as a whole, free of charge directly from your account settings. This is something credit reporting companies usually charge you for. For example, Equifax charges $60 a year for that. How do these free credit score retrieval services make money? As I said above, Get Credit Score is a wholly owned subsidiary of Equifax and it’s important that you understand that they are first and foremost, a marketing and lead generation arm for them. This is actually the only reason why Equifax even have this service in the first place! Yes, it’s how we keep this service free. From time to time, we may use your information in marketing for Equifax and our partners, but no other third parties without your consent. You can opt-out from our or our partner marketing at any time by contacting us and/or our partners. Basically, if you have a good credit score, you can expect to quickly start receiving marketing offers from Equifax and whoever else they partnered with. On the face of it, this may not sound very appealing but keep in mind that if your credit score is very good, you could potentially qualify for better interest rates than what’s on offer publicly to the general population.. However, if you are not in the market for a loan, you may not appreciate your data being used in this manner and if that’s the case, may prefer to stay away from Get Credit Score. If on the other hand, your credit score is quite poor, I suspect that you may start getting offers from various companies offering to improve your score for a hefty fee. We work with banks, energy companies, insurance providers and telcos to get better deals for Australians. We present offers based on your credit profile. Each time someone signs up to a deal offered through this website, we get a small payment from the supplier. We also sometimes receive a fee to show an offer on our site. We want to be transparent about how we make money, so you know how Credit Simple works. We’re not afraid to tell the banks, telcos or energy companies to do better and we work with them to get better deals for Australians. We then match offers to our customers based on their credit scores and their credit profile. While we don’t show or review all offers available in Australia, we believe all Aussies deserve better deals and we’ve designed Credit Simple to give you access to better financial deals and make more informed decisions. My main concern with all these type of services is whether they pass private information they collect to any third parties and the statements above don’t really answer that. Other – (i) our employees or contractors to the extent reasonably necessary to fulfil our obligations to you; (ii) anyone considering acquiring an interest in our business or assets; (iii) other entities or persons to the extent reasonably necessary for the purposes set out in clause 6.2 or clause 6.3 above; (iv) any law enforcement, legal, government or regulatory agency, where such disclosure is required or authorised by law; and (v) other individuals or companies authorised by you. You acknowledge that we do not control and are not responsible for any use of Personal Information by any third party that you disclosure, or authorise us to disclose, your Personal Information to. Basically, if you allow Credit Simple to provide your information to any 3rd party, you better be sure who this 3rd party is and how they are going to handle your personal information. It’s also worthwhile to make sure that the said 3rd party is an Australian entity and are keeping and handling your information solely on Australian soil. If they don’t, you may not have the protections afforded by the Australian Privacy legislation. Credit Simple won’t pass your information to any 3rd party unless you specifically request and authorise them to do so. However, some or all of these 3rd parties may store your information on servers and computer systems not located on Australian soil. Therefore, it’s important you understand that once your personal information leaves Australia, it is anyone’s guess as to how secure (or not!) it may be and what protections you may have (if at all) in the case a data breach occurs. We’re committed to helping Australians make savvy financial decisions by helping them understand their credit status, completely and utterly for free. We don’t even ask you for your credit card details. Our money comes from banks and other financial institutions. For example, they may pay us to show you their products. This enables us to give you your credit score and credit file information for free. We will never sell your data because we respect your privacy and we value your trust. We won’t ever share your personal information with credit providers without your consent. So, you will never be contacted by lenders or brokers as a result of using this service unless you explicitly request to be contacted. As you can imagine, and for pretty obvious reasons, Credit Savvy ticks the ‘privacy box’ for me and I feel comfortable enough to use them myself. Using the services mentioned in this post, you’ll be able to both find out and monitor your personal credit score without it impacting your credit score or costing you anything. Just keep in mind that your credit score and credit report are two DIFFERENT things. While Get Credit Score will give you your Equifax credit score, they will not give you access to your full Equifax credit report. Instead, you will need to approach Equifax directly in order to obtain your full credit report. The good news is that provided you meet these eligibility criteria, it won’t cost you a cent. To get your Equifax credit report click here. According to the website, Finder.com.au is using Experian and not Equifax? you’re right. Looks like they have switched to retrieving different scores. Thank you for this. When I was making inquiries last year to borrow for an investment property, someone told me to be careful of making too many applications as it might affect my credit score. At that stage I hadn’t really considered the potential impact on my credit score, or even where I could find my credit score. This is really useful and informative. I’ve been using credit savvy for 8 months and still no change on my score. I’ve paid off my CC and a small loan in the meantime yet this is not even recorded with credit savvy. I’ve started using credit simple with D&B and wow! All the updated info is there with a higher score difference of 250.
Credit savvy is very delayed with updating info. It’s not really credit savvy that is delayed. It’s Experian which is the credit reporting company that they retrieve their scores from. Each one of the three national credit reporting companies (as well as the Tasmanian one) have their own scale and methodology for credit scores and are completely independent of one another. thanks guys, this is a great article and i appreciate the time and research that’s gone into it. i’ve joined credit savvy, and now know that paying my electricity bill a few days late actually matters! not letting that happen anymore! this is brilliant – I’ve just signed up for Credit Savvy. I knew about the annual free report option but no idea we could get free monthly ongoing assessment.